“Kaplag”which means finding in Cebuano, recalls the discovery of the image of Snr. Sto. Nino by Spanish soldier Juan Camus on April 28,1565. He found the image burned inside the nipa hut after Spanish forces set fire to the village. Without the Kaplag Festival, there will be no Sinulog. The festival was celebrated more for its history and religious ties due to the commercialization of Cebu City’s Sinulog Festival. The first Kaplag celebration was held in the late 1990’s. Meanwhile, a first festival organized by the vendors of Taboan Public Market on 1994 and will offer discounts for dried fish during the festival. What is the connection of Snr. Sto Niño and Dried Fish? Kaplag Buwad Festival, a combination of two celebrations in Cebu, commemorates a historical event and the other is a thanksgiving for the blessings received through their main livelihood. Kaplag Buwad Festival is celebrated every last week of April at Brgy. San Nicolas, Cebu City. Hundreds and even thousands, both foreign and local tourists, gather to witness the yearly revelry in honor of Cebu’s patron saint, Señor Santo Niño. “Kaplag” is a Visayan word for “discovery” while “buwad” is a local term for “dried fish.” From the 2 words, you already get the idea on what the festival is all about. Kaplag is the celebration of the finding of the Señor Santo Niño image 40 years after the Portuguese explorer Ferdinand Magellan died. It is focused more on the second expedition in 1565 of Miguel Lopez de Legaspi in the Philippines where the Señor Santo Niño was found in the fire ruins at San Nicolas. Buwad is a thanksgiving celebration of the abundance and benefits received from the dried fish industry bestowed by the Señor Santo Niño. The barangay is known as a major supplier of buwad and you’ll find baskets full of these being sold at Taboan Street. In celebration of the Kaplag-Buwad Festival, vendors sell their products at a lower price. 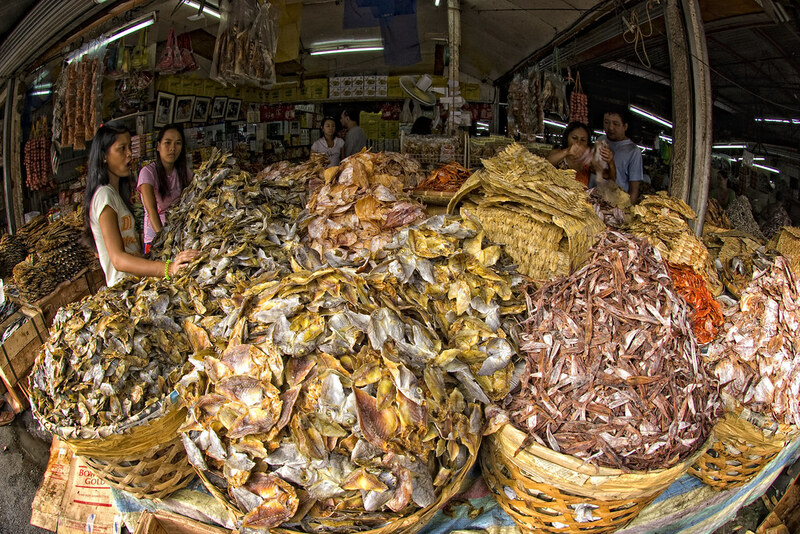 The dried fish and dried pusit are marked down or at a discounted price. There are also free tastes of buwad for customers. Don’t forget to buy pasalubongs. The usual favorites are dried fish, dried squid and dried mangoes.